You are currently browsing the daily archive for March 6, 2008. Think different, goes the Apple slogan. But how? Well – instead of thinking new, how about thinking old? How about going back to the future? BBC’s Business Day reports on a fine example. In San Francisco, Delhi, Dubai and elsewhere, a powerful trend is sweeping the world of cycling. Increasing numbers of people are buying “60’s bikes”, or fixed-gear bikes – bicycles that have only one gear, and no way of braking except slowing or dragging a foot. They are simple, tough, durable, and build fitness (imagine riding up a San Francisco hill in first gear!). This trend goes against the trend toward $2,000 18-gear bicycles along with colorful Tour de France fashion in skin-tights, helmets and matching water bottles. Fixed-gear 60’s bikes are part of what is known as the ‘austerian’ movement – austere is good, less is more, and do with cheap and simple rather than expensive, showy and conspicuous. Austerianism, in turn, is part of the new pro-environment green movement. These bicycles are an example of how nostalgia can be a strong basis for innovation, given in particular the growing numbers of older people worldwide. 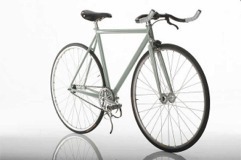 A fixed – gear bicycle: Ultimate simplicity. 1. Innovation is the key response, perhaps the only response, to waning popularity – in the face of the nearly irresistible tendency to do “more of the same”. In 1967 Beatlemania was waning. The Beatles had stopped touring and it seems that they were burned out. A Beatle statement that “we are bigger than Jesus” got them essentially expelled from Philippines. The Beatles went into the recording studio, for five months – a remarkably long time, then, for one album – and emerged with Sergeant Pepper. It took huge risks – and was rocket fuel for renewal of their popularity. 2. Technology is a key source of innovation. There were several new technologies in Sergeant Pepper, including the new Dolby noise reduction, automatic double tracking (invented especially for the Beatles), varispeeding, and a novel method for pressing LP’s. The Beatles were not afraid to use every possible one. 3. …But the technology was driven by product and process innovation. The Beatles innovated in the music, instruments, arrangements and even words. They used a sitar (George Henderson), and a miniature trumpet player from a London symphony orchestra, and also a harpsichord, as well as producer George Martin’s harmonium. Martin was a key innovator – he had a background as a classical musician. 4. Innovate everywhere: everything about Sergeant Pepper is novel – even the cover. The cover shows the word “Beatles” written in flowers, in a flower bed, and behind that the Beatles dressed as if they were a real Lonely Hearts Band, with a crowd of famous people behind them (Oscar Wilde, Marlene Dietrich, Karl Marx, Marlon Brando, etc.). The album was meant to be heard as a whole, not as individual songs, as one of the first ‘concept’ albums. The lyrics to a John Lennon song came nearly word for word from an old circus poster Lennon once bought. Like the DC-3, which was a portfolio of innovations, Sergeant Pepper combined many breakthrough ideas. 5. Innovation is best when its implementation is at its best. Beatles hired only top-flight session musicians (musicians hired just for the recording), and the 5 months they invested reflects their perfectionism. (150 days for a dozen songs, or nearly two weeks per song). 6. True innovations find commercial success – not always, but often. Sergeant Pepper was the #1 album in 1968 for 23 straight weeks. The CD, re-released in June 1987, was #3! and then again, in 1992, on its 25th anniversary, re-charted at #6. 7. Finally, innovation is about teamwork. All the songs were written by John Lennon and Paul McCartney. While each has written great songs on their own, the songs they wrote together are unparalleled for their novelty, creativity and appeal. Lennon and McCartney were utterly different in personality, lifestyle and values. That diversity perhaps strengthened their powerful collaboration. As a visiting professor at MIT, I quickly learned that Nick Negroponte was no ordinary professor. We academics are trained that science proceeds in incremental small steps. Nick always was a visionary. As a computer science professor, in 1977 he saw the future was in the convergence of computers, media, publishing and entertainment. He draw a simple diagram – converging circles – and went out to raise $10 m. to start a Center to explore the implications. No American company would fund it. The Japanese got it – and wrote him a $10 m. check, giving birth to the now world-famous MIT Media Center – a playground for ideas and creativity that has to be seen to be believed. Negroponte is now on a two-year leave from MIT. His vision: one laptop for every child. There are 55 m. children in Brazil, most of whom do not get proper schooling, or even any schooling. There are 200 m. children in China who need schooling. Negroponte wants every child to have a laptop. To do this, the price of the laptop must fall to $100. Right now it is $179 – but economies of scale are driving the price down. What about American kids? Well – parents can buy one, but a condition is that they must be two, and give one to a needy child abroad. Negroponte’s OLPC organization is not-for-profit, and he himself seeks no profit. His vision is simply to implement his vision for the world’s children. But there are obstacles. Negroponte selected AMD as the chip supplier. Intel, whose chips were too costly, has fought back and launched its own $100 laptop, called Classmate, which it offers to Brazil and other countries; Intel Chair Craig Barrett himself spearheads the effort. Negroponte’s laptop is designed by the world’s top ‘geeks’. Its battery life will one day reach 12 hours. Its screen is phenomenal – easily visible outdoors in full sunlight. A hand crank generates electricity, when the battery runs down. There are no ‘holes’ or connections, and the computer can be rained on or dropped or dumped in the sandbox… and survives. It has two green ‘ears’ that give it far better receptivity for WiFi than ordinary computers. It looks neat – it’s green and white color scheme make it friendly and attractive for kids. Most of all, it is simple. Negroponte designed it, so that one child can teach another, or children can simply learn to use it on their own, in three minutes – and they do! Lessons for innovators from OLPC? Perhaps a key one – said in the Bible centuries ago. The prophet Isaiah said: “Without vision a nation perishes.” (Isaiah 61, 11). In Hebrew, it is even more emphatic – “perishes” translates truly as “falls apart, crumbles”. Without vision, innovation falls short. What drives Negroponte to ultimate success, I hope, is his sweeping vision. He has used vision in the past to attain outstanding innovative success, with his Media Lab. And I hope his world-embracing vision will succeed again.